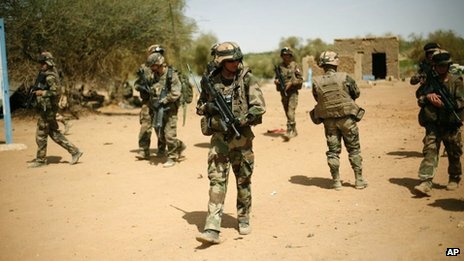 Malian troops and suspected Islamist militants are exchanging heavy gunfire on the streets of Gao in northern Mali. A BBC correspondent in the town says the clashes began near the central police station but have since spread. It comes a day after a suicide bomber blew himself up near a checkpoint at a northern entrance to the town - the second such attack in two days. The Movement for Oneness and Jihad in West Africa (Mujao) said it had carried out Sunday's attack on Malian troops as well as both the suicide bombings, AFP news agency reports. On Saturday, Mujao spokesman Abou Walid Sahraoui said: "We are dedicating ourselves to carrying out more attacks against France and its allies." The BBC's Tomas Fessy, in Gao, says Sunday's gun battle appears to have started around the main police station in the town centre, but there is now heavy gunfire coming from different areas. Our correspondent says people are barricaded inside their houses and the situation remains unclear. However, worries that Islamist militants had infiltrated Gao seems to have become reality, as they are waging a guerrilla war in the town, he adds.